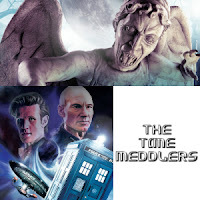 Recently I (Team Combom's Site/Tech Admin) joined a podcast known as The Time Meddlers with Ian Redman and David Morgan. Now quickly for those of you who can't remember moi, I provide videos and download/streaming links for the blog, often indirectly (as in I upload it and pass it to another member to post! ), and Ie. stuff I upload here. I also post reviews of the things I get a hold of or sent or whatever (plenty on my To-Do list so much more to come!). Anyway, the podcast contains 3 of us talking about a few things such as reviewing recently released products and the most important news articles. Of course, we also go onto other subjects and digress a lot. Nice advertising you've got there, totally not shameless.